Can you believe it? It is already time to start a whole new year! AGAIN! Last year I was READY for a new year.. this year, I am EXCITED about the new year and what it has the potential to bring! Just as years past there has been one word that has resonated with me for this new year. I know, most people think of JOY and their thoughts are limited to it being a "Christmas word" only. But why does it have to be? Joy is simply a way of life, or at least it should be. When you have JOY in your life, everything else just seems to fall into perfect place, and honestly you find this sense of contentment and overwhelming gratitude. Think about it. Think about the last time you truly felt JOY well up in your heart ~ remember how amazing that felt. That is what I am striving for in 2018, because I know when I find JOY in every single moment, I will indeed find peace, contentment, gratitude, and will be able to conquer all the dreams and goals I desire for my life personally, professionally, in my relationships and more. 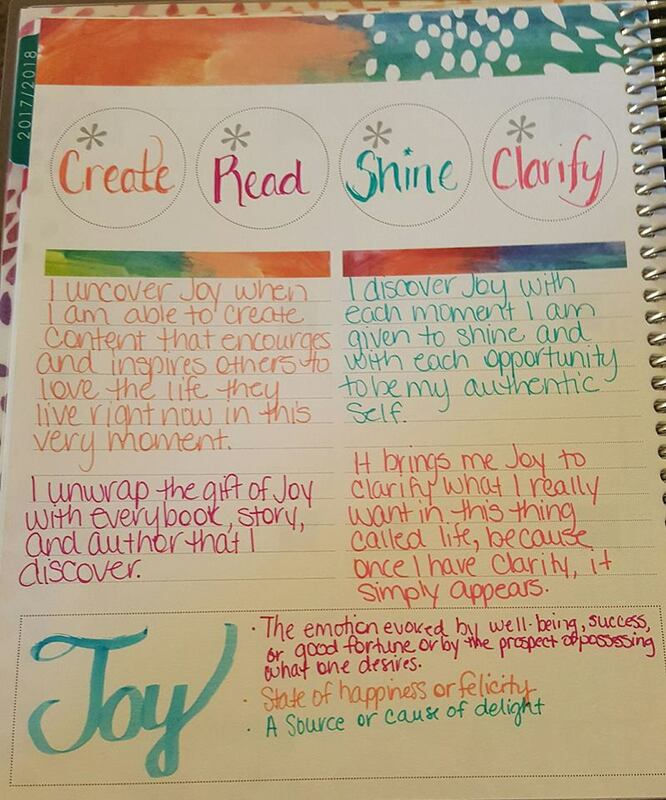 So for each month of the year, I am going to take the word JOY and expand on it four ways. I just finished working on January, and I couldn't be more pleased, or feel more prepared for a new month than ever before. 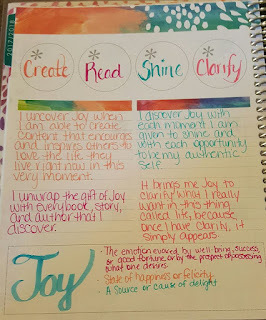 Create: "I uncover JOY when I am able to create content that encourages and inspires others to love the life they live right now in this very moment. " It's true. Whether it be a blog post, a YouTube video, the monthly Sniffbox subscription that I started last year or just a simple share on social media outlets like Facebook or Instagram if it encourages and or inspires ONE person to change their current perspective for the better, I find GREAT JOY and purpose. 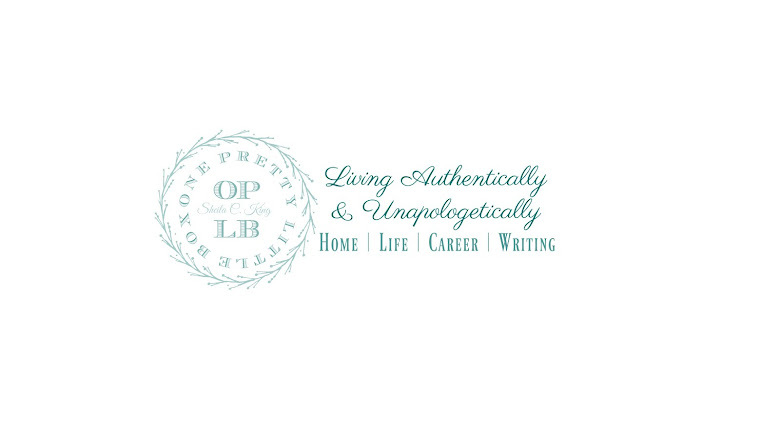 Read: "I unwrap the gift of JOY with every book, story, and author that I discover." This is so true and my lack of reading lately has been quite disturbing. Thankfully I have an audible subscription and have taken advantage of that over the last few months, but there is nothing that can replace holding a book in your hands, highlighting life changing words, and experiencing the whole shebang. I will be sharing in another post my Books of the year that I want to enjoy, digest, and apply to my life. Stay tuned for that! Shine: "I discover JOY with each moment that I am given to shine and with opportunity to be my authentic self." The biggest gift of 2017 that I was given was the gift of being my authentic self with no questions asked, no lectures given of who I should be or what I should be doing, just me being me. And do you want to know something? I love it! I love me. I love who I am and that is a good feeling. I no longer nitpick myself looking for flaws to fix. 2018 isn't about fixing anything ~ but instead finding JOY in what is and allowing whatever it may be to truly evolve to become what it was intended to be. When I am my authentic self there is no negative self talk. There is none of this comparing myself to others. Let's face it, when I am authentically me, I have a hard time following the pack . Maybe it's because I am a Virgo, or perhaps it is because I was the baby in my family, who knows. When I am ME, and doing things the way that feels right to me, I truly SHINE because I am full of that Joy that I talked about earlier. Clarify: "It brings me great JOY to clarify what I really want in this thing called life, because once I have clarity, it simply appears." For so long, my life felt like it was being tossed by the waves, the direction of the wind, or simply just sitting waiting to be decided. Little did I know, it was because I was not very clear on my intentions, on my desires, nor what I want in life. Now that it is becoming clearer, I want to make certain that clarity is at the forefront of my mind. From the little details of my everyday life, to big life shaking decisions. So there you go. 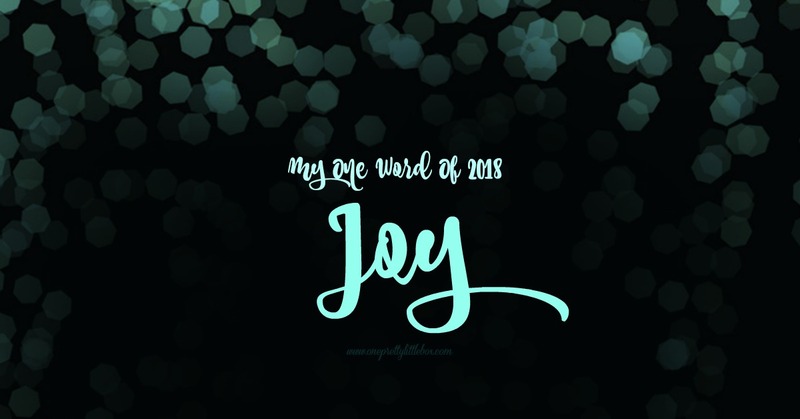 My word of the year is JOY, and in January I will be focusing on that JOY as I CREATE, READ, SHINE, and CLARIFY! How about you? What are YOUR plans? Happy New Year, and if you take away anything from this post, please take away the truth that JOY is available YEAR around ~ it is simply up to you to find it, embrace it, and live it.